I have to admit that my cake didn’t have as many cherries as hers. Well, American cherries are rather expensive around here. But still the result didn't disappoint me. 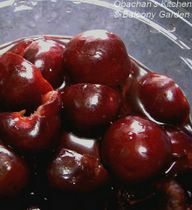 I soaked the cherries in sherry for 15 to 20 minutes beforehand as someone mentioned in her comment to LPC’s post. (Yes. What's in the photo is halved cherries in sherry.) It was definitely a good idea, as I had expected. Also I added a twist or two of my own—I replaced about 1/3 of the flour with almond powder, and used soy milk in place of milk. 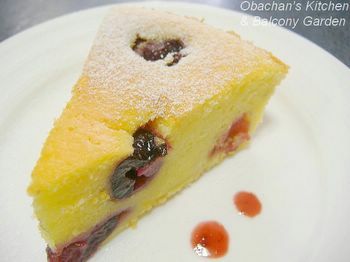 And the result was a scrumptious combination of soft, moist and rich (but not heavy at all) cake and refreshing cherries! I must make this cherry clafoutis again for my sister sometime this summer. She and her kids will love it, too. Looks scrumptious, and the use of almond powder and soy milk sound good! I've seen recipes for clafoutis and have also seen the cakes for sale at my local gorcery store's patisserie. I need to try it sometime! I'm sure you'll enjoy your clafoutis. 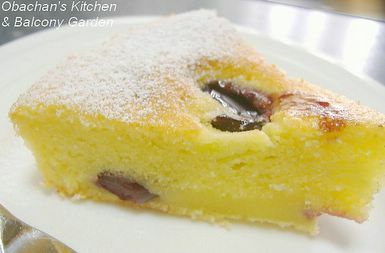 I found some clafoutis recipes on Japanese websites that used grapes instead of cherries. So that's something I might try in the near future. Hi there... your this recipe sounds interesting... may i know how much cherry u used for this recipe.. cos cherry over our side here is also very expensive... can we replace it with those canned syrup cherry instead? I guess replacing the cherries with blueberries would be OK. I found a blueberry clafoutis recipe and the proportion looks almost similar to LPC's recipe, so I cannot guarantee, but just assume that the replacement would not result in a disaster. 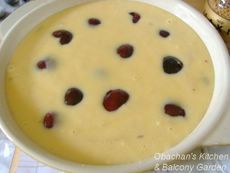 Hello Obachan - So happy you tried the recipe and liked it! It's one of the easiest French cakes to make. The other is a yogurt cake - every French girl learns this at home with her Maman. I'll definitely keep in mind to share the yogurt cake with you next time I make it! This was really good. Thanks again for sharing the recipe. Better luck next time (if you are going to try again). I love to read your blog which is always so interesting! This is my 1st time writing to you as I need to request from you the recipe of Cherry Clafooutis, which I love to try to bake...it looks yummy!! Thanks in advance.